This stylish business centre has recently been refitted to provide a range of spacious, flexible and comfortable office spaces to suit a range of business types. Many excellent amenities are available, including conference facilites and relaxing courtyard. Located in the town centre, just a few moments from the beach. Suitable for a range of businesses this business centre is a few hundred meters from the main shopping area of Aberystwyth. Offices are suitable for two to four people while on the ground floor there are also meeting rooms available and a coworking area. Transport links are good with Aberystwyth Railway Station within walking distance of the centre. There are great facilities including a kitchen area, reception area and conference facilities. 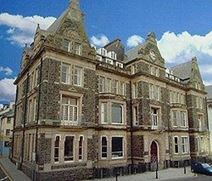 Fully serviced offices in a professional business environment situated in a historic period building with a sea front position and great views of Cardigan Bay. Facilities include secretarial support, reception service, Wi-Fi, meeting and conference suites, onsite restaurant, cleaning and maintenance. Ideally located close to town centre shops, amenities and parking.